Black garlic’s organoleptic characteristics and nutritional composition distinguish it from standard raw garlic or aged garlic. Its sweet, melt-in-the-mouth flavour has made it a popular ingredient in Japanese cuisine. It also contains high levels of antioxidants, particularly S-allyl-cysteine; indeed the many health benefits offered by black garlic are due to the presence of this phenolic compound which has been studied extensively in recent years. S-allyl-cysteine has significant antioxidant potency and a cardio-protective effect, which is why our ABG10+® supplement has been specifically formulated to contain one of the highest concentrations of S-allyl-cysteine available in a dietary supplement. 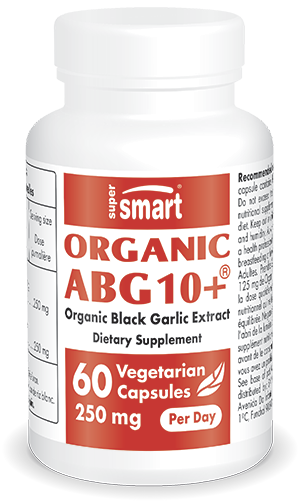 Our ABG10+® dietary supplement is formulated from a black garlic extract standardised to 0.1% S-allyl-cysteine, one of the most powerful doses available. It is in capsule form, with a recommended dose of two capsules a day.